Bella and Sadie save their human after a stroke. When Bella (back) wasn't comforted with treats and Sadie wasn't around, the neighbor knew something was wrong. A few weeks before Christmas, St. Augustine resident Alexandra Naspolini was enjoying a cup of coffee when she heard a neighbor’s dog barking frantically at her back door. When Naspolini stepped out of her house, she saw Sadie standing by Hatcher’s open front door, barking loudly. Naspolini ran across the street and entered Hatcher’s home, where she discovered her neighbor lying unresponsive on her bed. Hatcher, 62, was showing clear signs of a stroke: confusion, weakness on one side of the body, and trouble speaking. Naspolini called 911. Eleven minutes later, St. Johns County Fire Rescue arrived and transported Hatcher to Baptist Medical Center Jacksonville, home to one of only seven certified Comprehensive Stroke Centers in Florida. When she arrived at Baptist Jacksonville, Hatcher was whisked away to the Neurovascular OR for an emergency surgical procedure to unblock the brain vessel. Dr. Nima used a special device called a stent retriever to remove the clot by making a small incision in the groin and then passing a microcatheter into the blocked vessel. The minimally invasive procedure, called an endovascular thrombectomy (EVT), took only 20 minutes. Just hours after the procedure, Hatcher was already Facetiming with her family. Three days later, she was discharged after regaining all strength on her left side. It’s hard to pinpoint exactly when Hatcher’s stroke occurred because no one else was home at the time. She awoke at 7 am feeling ill and collapsed in the bathroom around 11 am, but Bella didn’t arrive at Naspolini’s back door until around 2 pm. By then, seven hours had elapsed. In years past, it was unknown whether acute ischemic stroke patients like Hatcher would benefit from EVT if six or more hours had passed since the onset of stroke symptoms as brain cell death can happen rapidly in some patients. But a groundbreaking study known as the DAWN trial showed that certain stroke patients would benefit from the emergency surgical procedure, even six hours after the brain attack and in some case, up to 24 hours. And the trial showed that those same patients had fewer disabilities and an increased ability to carry out daily activities after 90 days. 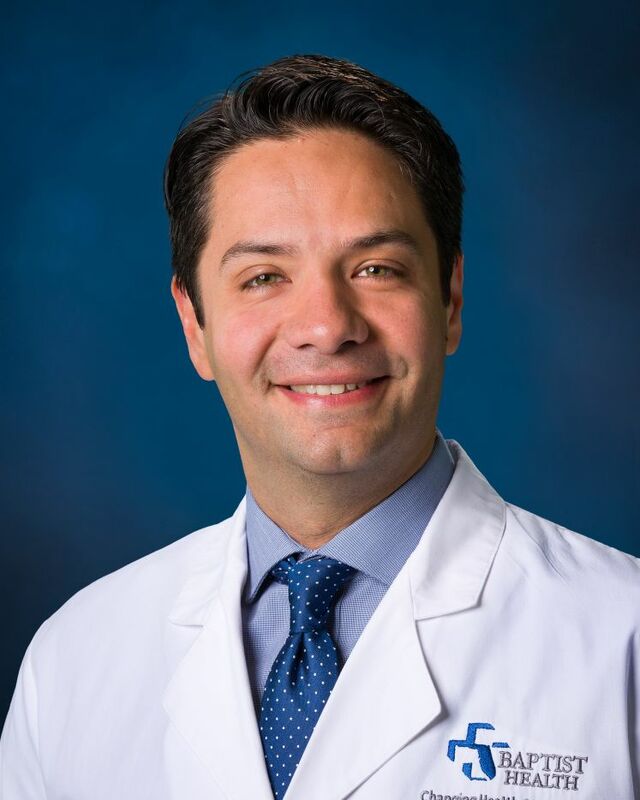 “The DAWN clinical trial is revolutionary because it truly impacted the way stroke patients are treated,” said Dr. Nima, who was recently recognized with the 2018 “Young Investigator Award” by the Society of Vascular and Interventional Neurology for his research with a subgroup of the DAWN trial. “Because of this research, we now know that patients can benefit significantly from intervention outside of a six-hour window, like in Hatcher’s case, and even up to 24 hours after the onset of symptoms,” he said. Hatcher is forever grateful to her Stroke Center team and her neighbor, but she also owes her life to her beloved dogs. Little did she know when she rescued Sadie, a black Labrador retriever, in 2013, Sadie (and her best pal Bella) would someday rescue her. BE FAST and CALL 911 IMMEDIATELY if you observe any sign of a stroke. For more information on the certified Comprehensive Stroke Center at Baptist Medical Center Jacksonville, visit baptistjax.com/stroke. T Time: If you observe any of these signs, call 911 immediately.